Sun. #2 is HERE. To help the site subscribe to Mistah MegaManFan so we can reach 1,000 (current count: 852). If you're a gamer you'll enjoy it! Don't miss WWE Raw highlight videos later tonight! With the cheap plugs out of the way here's Monday's latest wrestling news. 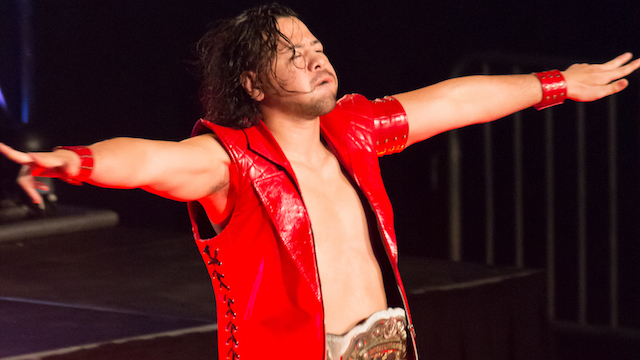 According to Dave Meltzer, Shinsuke Nakamura will be staying with WWE, which concurs with reports that he had no talks with New Japan Pro Wrestling this year about returning. In this interview Matt Hardy says that conditions in WWE have improved greatly: "When I first started here, myself and my brother, it was like '97, beginning of'98, whenever we signed contracts, and really the locker room and everything was like the wild wild west then. The change that has happened in those 20-plus years has been unreal. I mean, now the drug testing is very stringent. You have to be here, and you have to be good. And you have to be on top of your game. You have to be a professional. The physicals they do as far as cardiovascular and just checking you over and over - there has been several guys they caught that have had serious issues that could have been life threatening if they didn't catch it here, and just the way they take care of you." * Rina pinned her twin sister Hina with a bridge. * Tam Nakano won a 3-Way Match over Hanan Kimura and Kebel Kel by pinning Hanan. * Natsuko Tora, Leo Onozaki, and Saya Iida beat Hazuki, Natsu Sumire, and Andras Miyagi when Sumire pinned Iida after a brainbuster. * Arisa Hoshiki, Saki Kashima, and Starlight Kid beat Konami, Bea Priestley, and AZM when Kid pinned AZM. * Main event to determine the order of draft picks: Kagetsu vs. Momo Watanabe vs. Mayu Iwatani vs. Hana Kimura vs. Jungle Kyona in an Elimination Match (pin, submission, and over the top rope rule for eliminations). * Iwatani eliminated Kagetsu first sending her over the top rope. Iwatani gets first draft pick. * Watanabe eliminated Kagetsu over the top rope to get second pick. * Kagetsu eliminated Kimura over the top for third pick. * Kimura eliminated Kyona over the top. * Jungle Assault Nation must disband as a until as the last place until in the match must disband per stipulation. * THE DRAFT - Iwatani drafts Starlight Kid. Watanabe drafts AZM. Kagetsu picks Hazuki. Kimura drafts Jungle Kyona. Iwatani drafts Arisa Hoshiki. Watanabe drafts Utami Hayashishita. Kagetsu drafts Andras Miyagi. Kimura drafts Konami. Iwatani drafts Tam Nakano. Watanabe drafts Bea Priestley. Kagetsu drafts Natsuko Tora. Kimura drafts Mary Apache. Iwatani drafts Saki Kashima. Watanabe drafts Viper (Viper must be allowed to still work some STARDOM dates by WWE just as Toni Storm will). Kagetsu drafts Jamie Hayter. Kimura drafts Natsumi. Iwatani drafts Hanan. Watanabe drafts Chardonnay. Kagetsu drafts Session Moth Martina. Kimura drafts Rebel Kel. Iwatani drafts Xia Brookside. Watanabe drafts Leo Onozaki. Kagetsu drafts Natsu Sumire. Kagetsu/Oedo Tai says no more drafting from them as they are satisfied with their picks. Kimura drafts Bobbi Tyler. Iwatani drafts Saya Iida. STARS stop drafting. Watanabe drafts Hina. Queen's Quest stops drafting. Kimura picks Ruaka. Kimura picks Hanan. Kimura picks Kaori Yoneyama. Here Beth Phoenix talks about teaming with Natalya and getting respect from Bret Hart: "It was a full circle moment. Bret Hart vs. Owen Hart (at WrestleMania X) was the match that made me certain I was destined to become a wrestler. On the 25th Anniversary, I got to walk to the ring to the Hart Foundation music in pink and black and hi-five my hero." In this interview Cary Silkin says ROH could work with AEW in the future: "Listen, you've been watching this stuff long enough, and been covering it long enough, and been a fan long enough to know anything's possible. So, maybe it's not really in the cards at the moment because people's feelings might be a certain way. I would think maybe six months from now or a year from now, the whole thing could be different. So, we'll see what happens." Booker T's brother Stevie Ray explains why he never wanted to go to WWE after WCW was sold: "When I stopped WCW, I went overseas for three-and-a-half years. I was going back and forth over there. I didn't want to go to WWF; as a matter of fact, the last WCW Nitro I didn't even attend and they sent me a ticket, but I was always in the mindset of this is competition to me. This is NFL vs AFL or National League vs American League in baseball. WCW vs WWF, to be honest with you bro, I didn't want to go out like a b---h."
In this interview Ken (Mr.) Anderson is not a fan of David Arquette: "I feel like David made kind of a mockery of our business. He did so way back in the 90s when he won the WCW World Heavyweight Championship on a fluke. Then he went away from awhile, now he's back, and I don't know what he's trying to accomplish. David has never taken the time to get properly trained to do what we do. He just happened to jump in the ring. He says he set up a ring in his backyard and basically has been training himself by watching YouTube videos. That's not the proper way to do what we do. Owning a wrestling academy, myself, I've spent the last two and a half years grooming the next generation of superstars and teaching them how to properly respect the business and respect those around them. And I feel like he's just taking the piss." Here Vickie Guerrero says she's doing a new Table For 3 with Kurt Angle and Eric Bischoff: "It's our second family and I'm sure Kurt will be back many times when they call him so you can never leave and that's the great thing because when you leave your doors open, it's always something you can look forward to... WWE, they called me to do Table For 3 tomorrow night with Kurt Angle and Eric Bischoff so, that's gonna be pretty incredible. So, you always go back and get your soul fed a little more so that's the gift of going back to WWE." In this interview Dragon Lee says he wants to defend his IWGP Jr. Heavyweight Title against Hiromu Takahashi: "What I miss are those struggles. I think they have been one of the most painful days that I have dawned, the days where I have been more bruised, more beaten. They have been with Hiromu. As much to me, as to him, as to the liking they have liked those fights. In Mexico they threw money at us and it became a very famous fight; he came to Japan; He came to the United States; I think it is something international that has been given and I am very happy with these great events. I just know that I will take this opportunity and I will be champion tomorrow so that the American public knows who Dragon Lee is. I have conquered the Latin audience, the Japanese and I just need the one from here in America." WWE has signed former CWH announcer Jonny Loquasto and his last taping with the promotion was yesterday. (PWI) A video of him is below. For those interested spreaker.com/user/liliangarcia/cg-ricochet-final here's Ricochet's interview with Lilian Garcia. Here Joey Ryan explains what people get wrong about intergender wrestling: "I think an important difference between domestic violence and professional wrestling is consent. The wrestlers have agreed to wrestle each other... as opposed to domestic violence which isn't consented. I'm heavy on the theatrical side of pro wrestling and there is a split as to if pro wrestling is a sport or if it's theater. I lean towards the theatrical part... I don't really see the trigger of it because it's consented and it's theater."